NEPALGUNJ, Nov 8: Raji Ram Yadav of Hirminiya-8, Banke, produced 20 quintals of paddy this year. Saddled with loans, he took the paddy directly to traders in Dhamboji from his farm. But he received only Rs 1,825 per quintal. Further, he had to bear transport and labor charge himself. Another farmer Manoj Kumar Sahu of Udayapur could only get Rs 1,865 per quintal for his paddy crop. Sahu, who had sold paddy at Rs 2,000 per quintal, said he had to sell paddy at lower price because of financial problems. “Price of paddy is falling, but price of every other thing is increasing,” a hapless Sahu said. Fall in price of agri products and rise in price of seeds and other inputs have left many farmers worried. 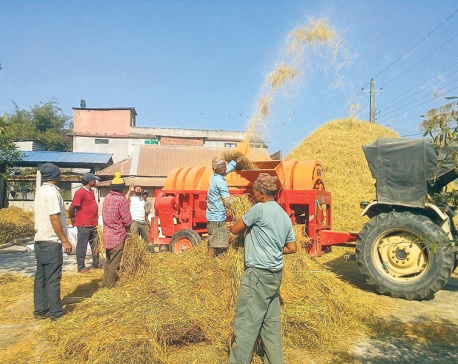 Farmers of Banke and Bardiya have been selling paddy to traders in Nepalgunj for the past many years. Paddy procurement season began two weeks ago, according to Raj Kumar Gupta, who runs a rice mill at Khajura Road in Dhamboji. “Some farmers are already selling paddy, while some are waiting, expecting that the price will increase,” added Gupta. Another trader Ganesh Gupta said Nepali paddy is not getting price because of the unchecked entry of Indian rice into the Nepali market. “Farmers are not getting good price for paddy as the Indian rice is cheaper,” he added. The price fixation committee, which is led by the chief district officer (CDO), has not done any preparation to fix paddy price. However, Banke CDO Jagat Basnet told Republica that the NFC has not informed him anything about the issue.